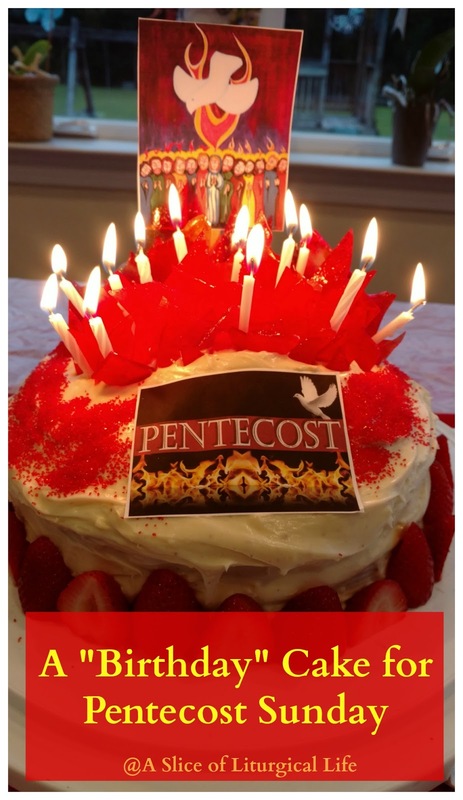 A Slice of Smith Life: A "Birthday" Cake for Pentecost Sunday AND the "Birth" of My New Blog! A "Birthday" Cake for Pentecost Sunday AND the "Birth" of My New Blog! Today happens to be the "birthday of the Church" or Pentecost Sunday! What is Pentecost? Read more at my new blog at A Slice of Liturgical Life. But, I'm so excited about my new blog, I'm getting ahead of myself so before you read more about Pentecost, I need to give you some background information below! Read on! When I first started this blog in June 2010 (WOW! Was that really 7 years ago!) I was brand new to blogging and had fun creating my own blog as a hobby to document and savor the sweetness of faith, family and homeschooling. This blog's look has changed through the years, as well as my focus and mission of it. I have enjoyed the journey and have met some amazing friends! Some I have met in real life, but there are many others I would love to cross paths with besides in blog land. In the last few years, I have noticed a trend with my posts. I realized that I blog a lot about the liturgical year and the Church's feast days. My passion has become to evangelize to my family, friends, the world and anyone who will listen, about the beautiful, rich history and devotions of the Catholic faith, as well as document the fun our family has had focusing on the liturgical Church year with prayers, activities, crafts, and creative foods. With that being said, this little corner of blog land will be quieter and posts will be less frequent because my heart is now into creating a new blog A Slice of Liturgical Life. This is definitely a work in progress and will be for a long time, but I hope you will come along for the ride and learn about living the treasures of the Church with family, friends, joy and simplicity alongside me! My new blog is in it's infancy (do you hear what I did there? :) ) and it will take much time to grow, but I look forward to the journey ahead and I'm excited to share ideas, resources, and organization tips with you regarding living liturgically with family, friends, joy and simplicity! For more information about A Slice of Liturgical Life, visit my About page. THANK YOU to all those that have followed A Slice of Smith Life through the years....I hope you will follow my new blog as well! Please check out the "birth" of my new blog and if you would like receive updates on A Slice of Liturgical Life posts be sure to subscribe via email below. You can also follow me on social media on Instagram, Pinterest and Twitter and A Slice of Liturgical Life's Facebook page by "Liking" the Facebook page, . I would love to hear your thoughts and/or questions about A Slice of Liturgical Life! What feast day would you like to know more about? Please comment below or over at A Slice of Liturgical Life. I would love to hear from you! If you would like to subscribe to my new blog, A Slice of Liturgical Life, and never miss an update or post of it's progress, fill in your email address below! Heading over to visit the new digs! !